Learn to compose and make tasty sushi rolls like Japanese sushi chefs. Sushi rice is not the easiest rice to cook in the world and even the weather affects the cooking of rice. It is also important how you roll a sushi roll. You can very easily roll it too tight or too loose. To make the perfect sushi roll can be complex. It can be explained in a simple way, where I step-by-step guides you to make tasty rolls. You get an introduction to what distinguishes authentic Japanese sushi and European sushi. You learn to handle the various steps for cooking sushi rice. You learn how to cook sushi rice according to Japanese cooking techniques. 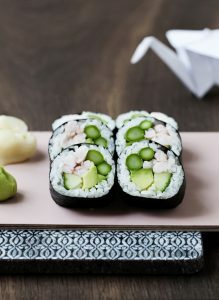 You work with Japanese ingredients that give the unique aromas and flavors that characterize Japanese sushi. You learn what Japanese sushi chefs look for when buying fish and shellfish at a fishmonger. You learn how Japanese sushi chefs handle different kinds of fish. You work with different cutting techniques and cut different kinds of fish and vegetables for sushi. You learn step-by-step to make hosomaki (small roll), uramaki (insite-out) and futomaki (big roll). You learn to make hosomaki (small roll), Uramaki (insite-out) and futomaki (big roll). 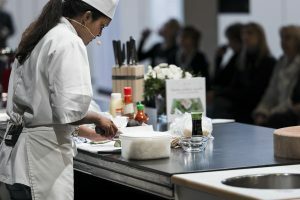 At the end of the course you will make your own signature sushi roll. In total 32 pieces of sushi that you bring home. Sunday 28 April 2019 from 3:30 to 5:30 p.m. at danbolig, Østerfælled Torv 10, 1. sal, 2100 Copenhagen Ø, Denmark. Price per participant: 625 DKK. Sunday 12 May 2019 from 3:30 to 5:30 p.m. at Manuvision, Bernhard Bangs Alle 25, 2000 Frederiksberg, Denmark. Sunday 26 may 2019 from 3:30 to 5:30 p.m. at danbolig, Østerfælled Torv 10, 1. sal, 2100 Copenhagen Ø, Denmark. Sunday 2 June 2019 from 3:00 to 5:00 p.m. at Manuvision, Bernhard Bangs Alle 25, 2000 Frederiksberg, Denmark. Sunday 30 June 2019 from 3:30 to 5:30 p.m. at danbolig, Østerfælled Torv 10, 1. sal, 2100 Copenhagen Ø, Denmark. Sunday 14 Juli 2019 from 3:30 to 5:30 p.m. at danbolig, Østerfælled Torv 10, 1. sal, 2100 Copenhagen Ø, Denmark. Sunday 18 August 2019 from 3:30 to 5:30 p.m. at danbolig, Østerfælled Torv 10, 1. sal, 2100 Copenhagen Ø, Denmark. Sunday 1 September 2019 from 3:30 to 5:30 p.m. at Manuvision, Bernhard Bangs Alle 25, 2000 Frederiksberg, Denmark. Sunday 29 September 2019 from 3:30 to 5:30 p.m. at danbolig, Østerfælled Torv 10, 1. sal, 2100 Copenhagen Ø, Denmark.